1. Right-click on the project's "References" node, then select "Manage NuGet Packages"
3. 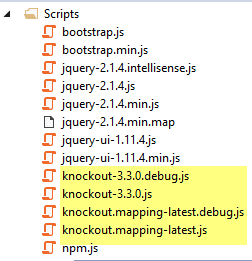 You should see a green checkmark after you finished adding the knockoutjs library to the MvcApp project. 6. Open the BundleConfig.cs file in the "App_Start" folder type the following lines of code inside the RegisterBundles method, this tells MVC to include any files in the "Scripts" folder that starts with the string "knockout"
The entire code looks like the following up to this point in our project.